It's been suggested this is far too much work. I like knowing what's in the broth. I LOVE making something which will save us money from things we would have thrown out otherwise - veggie scraps and carcasses. *I dumped in a LOT of thyme, rosemary, parsley, marjoram this time and it tastes much better - use your taste preferences. *Bag of veggies - onion stops, carrot ends, celery pieces...whatever I have left over or from chopping goes into a a gallon bag in the freezer. 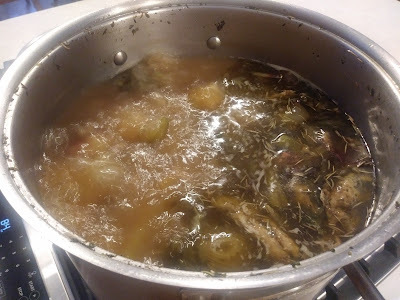 When I make stock I dump it into the pot. Bring to a boil. Skim off the foam that rises. Simmer long enough for broth to reduce by 1/2 - this takes 3 - 5 hours. I've discovered if I let it reduce by about 1/4th - it is at a 1/2 when I remove the bones and strain the veggies. Remove bones, strain veggies. I strain in my colander 3 or 4 times. If you want it without any bits of herbs - use cheesecloth. Cool in fridge or out in snow on deck. Skim the fat off the top. Put into freezer bags or begin the canning process. Some of the process is in this video at the 1:40 mark.